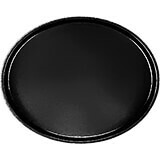 Oval shaped fiberglass trays are perfect for serving dinners, banquets, parties and other large gatherings. Available in two sizes. Large Oval Camtrays for large gatherings. Special order item not carried in stock, non-returnable. One case order minimum. Lightweight for easy carrying. Camtrays are also space and time efficient since they can be stacked. Special order item not carried in stock, non-returnable. One case order minimum.